HomeGold IRA BlogFeaturedThe stock market: Will history repeat itself? 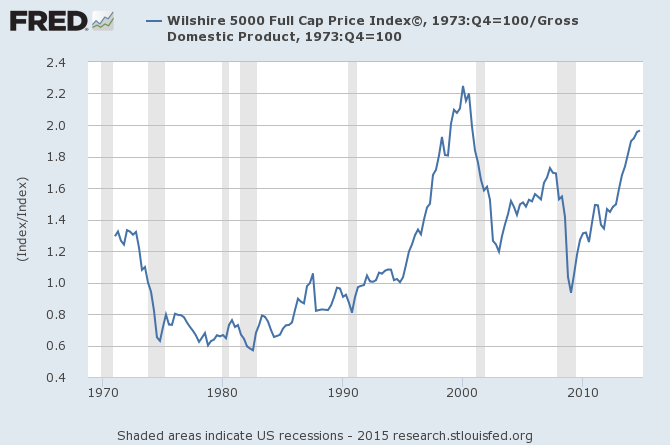 The stock market: Will history repeat itself? No one has a crystal ball for the stock market, but what we do have to look at is history. Although past performance does not guarantee future results, when it comes to the U.S. stock market’s current situation, history shows some alarming parallels. Below are two charts regarding the stock market that will have you wondering: Will this time be different, or will history repeat itself? In a 2001 Forbes Magazine interview, Warren Buffett called the Market Cap to GDP indicator “probably the best single measure of where valuations stand at any given moment.” Therefore, this indicator came to be known as the “Buffett Indicator”. It measures the percentage of GDP that represents stock market value, and is used to determine whether the stock market is over or undervalued at a given time. A value over 100% is said to show overvaluation, while a value around 50% is said to show undervaluation. What’s important to pay attention to on this chart is the last two years in which the indicator reached a high: 2000 and 2007. In 2000 the market experienced a crash after the Dot Com Bubble burst, contributing to the early 2000s recession – and we all remember what happened in 2007-8. Right now, the Buffet Indicator is at its second-highest level in 60 years. Will this time be different, or will history repeat itself? As the chart shows, U.S. stocks as measured by the S&P 500 index have never been up for more than six consecutive years. Currently, the stock market has been up for six years in a row: 2009 to 2014. 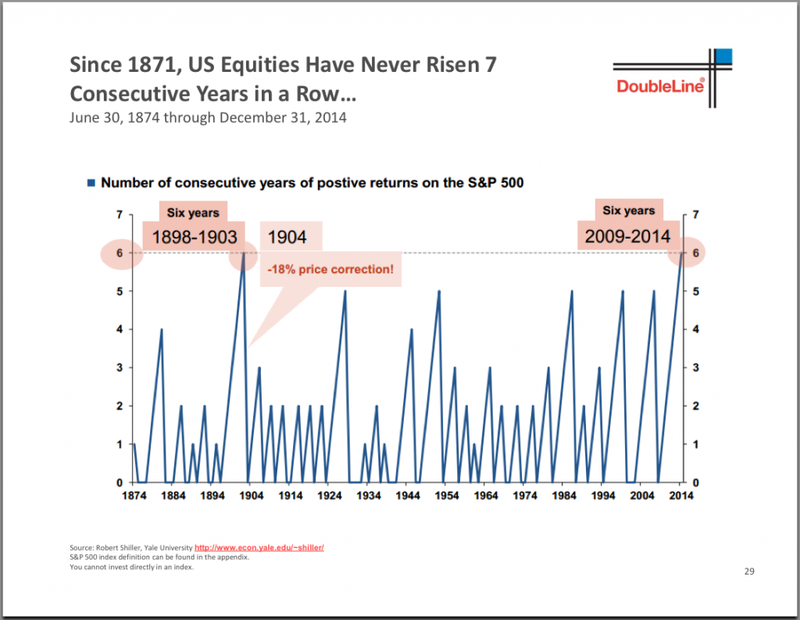 If it ends 2015 with positive returns, it will be the first time in history that it has done so for more than six years in a row. Bull markets eventually get tired, and our current one is reaching the point at which past bull markets ran out of steam. Again, although past performance is not indicative of future results, ask yourself: will this time be different, or will history repeat itself? Call American Bullion today at 1-800-326-9598 to speak with a precious metals specialist about adding gold to your retirement portfolio or purchasing coins and bars for secure direct delivery.